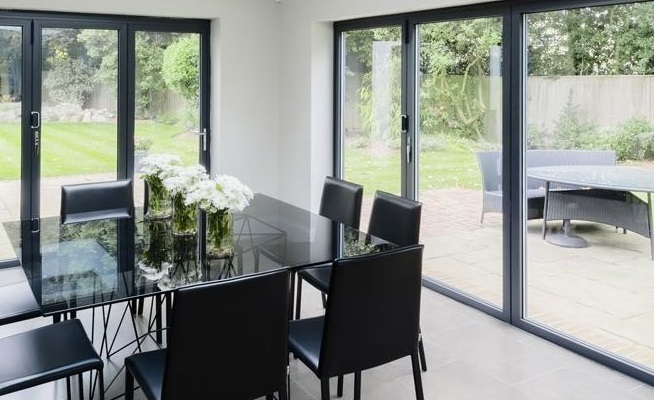 KAT have been involved in aluminium bifolding door manufacture right from the outset and have been able to specify the very best in design. KAT-KAWNEER Aluminium bifolds will completely transform a large opening in your home and are guaranteed to become a huge talking point. Select from BLACK Matt, ANTHRACITE GREY Matt, LIGHT GREY Matt, CREAM Matt and WHITE Gloss or go for the dual colour options of BLACK Matt or ANTHRACITE GREY Matt with WHITE Gloss. Marine grade paint guarantee option available. KAT doors are currently the highest performing doors in the UK in tests against wind, water and air pressure (severe weather tested to BS 6375/1:2009). They come with an extended 10 year warranty whilst the design and engineering tests have shown that they have a life expectancy in excess of 25 years. Offering a complete range of uPVC Woodgrain Foil finishes to match existing uPVC products with a range of threshold options, opening configurations and spanning up to 6 metres, the KAT uPVC BiFold has been severe weather tested to BS 6375/1:2009 and is certified to PAS23/24, making this the best performing uPVC BiFolding door in the UK.